Updated: Clarified that earbuds are not included with the phone. HTC today announced the 10, its flagship handset for 2016. This Android phone carries forward an aluminum design, for which HTC has become known, and makes big improvements to the camera, software, and other core features. The 10 is milled from a single block of metal and includes exaggerated chamfers along the edges to help set it apart visually from competing models. The 5.2-inch quad HD screen is covered in 2.5D glass that curves where it meets the metal. HTC stepped up the camera to 12-megapixels. The camera can launch in 0.6 seconds, has an aperture of f/1.8, and includes optical image stabilization, laser-assisted focus, and two-tone flash. The user-facing camera rates 5-megapixels and also includes an aperture of f/1.8 and OIS. The phone runs Android 6.0 Marshmallow with the freshest version of Sense from HTC. Importantly, HTC is committed to reducing app duplication on its devices and has dropped a handful of its own apps (calendar, calculator, browser, gallery) in favor of Google's. The 10 also drops some Google apps (camera, messenger) in favor of HTC-made apps. HTC made changes to BoomSound, as well. Rather than offer two full-range speakers that deliver stereo sound, HTC separated the speakers into their tweeter and woofer components, located in the earpiece and along the bottom edge, respectively. HTC claims this arrangement delivers superior sound quality, even if it's not stereo. At the same time, HTC added software that allows people to create individual sound profiles that can be paired with the optional set of earbuds. Other hardware features include a Snapdragon 820 processor with 4 GB of RAM, 32 GB of storage, and support for 2 TB memory cards. The 10 relies on a USB Type-C connector and includes the same fast fingerprint sensor found on the One A9. The HTC 10 packs a 3,000mAh battery with Quick Charge 3.0 and advanced power management functions that HTC says delivers two days of battery life. 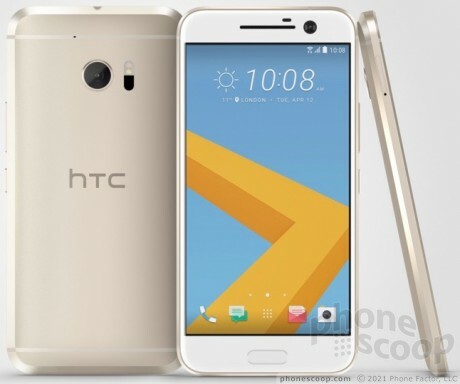 The HTC 10 will be available in silver, gold, gray, and red. HTC said Sprint, T-Mobile, and Verizon Wireless plan to sell the phone in the days ahead. Each carrier will announce pricing individually. Separately, HTC plans to sell an unlocked (for AT&T/T-Mobile) and bloat-free version of the 10 from its own web site. The unlocked version will be available in silver and gray. It costs $699 and includes one year of Uh Oh Protection against cracked screens and water damage.